Graphic Ear | WAYO 104.3FM Rochester, NY | Way out, right here. Each week, we'll welcome a visual artist into the studio. We'll chat about their work and the music they listen to. And we'll play some swell tunes. The show will sound wonderful, thanks to Joey P. Groovy. 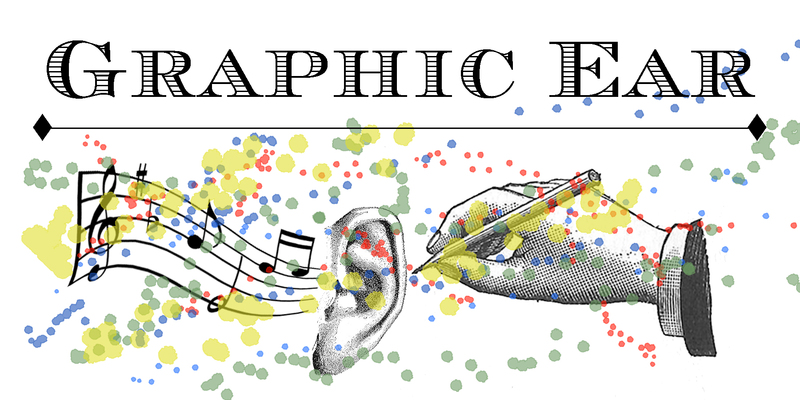 In this edition of Graphic Ear on WAYO 104.3 FM we talk to Robert Mostyn about the role music has played in his life, from being in a band to organizing chip music festivals. Plus, the world of game development, including the release of A Small Robot Story. In this edition of Graphic Ear on WAYO 104.3 FM we talk to Lindsey Downey about addiction and the road to recovery, issues that affect so many artists - and non artists. In this edition of Graphic Ear on WAYO 104.3 FM we talk to Haley Kenton of Crackpot Crockery about her new nerdy pottery line, ranging from vikings to Super Mario. Plus, her love of reptiles, especially pythons, and so much more! In this edition of Graphic Ear on WAYO 104.3 FM we talk to Carla Staples all about her wood earrings, the people that have influenced her work, how she got started making wood jewelry, the process of making her earrings from start to finish, where she does her work, what a typical day looks like, a few upcoming shows she'll be at, and much more! In this edition of Graphic Ear on WAYO 104.3 FM we talk to painter Marisa Bruno about studying art at SUNY Fredonia, the difference between art in high school versus college, why she prefers oil paints, her senior show, wanting to take some time before grad school, her day job, her painting process, and so much more! In this edition of Graphic Ear on WAYO 104.3 FM we talk to James Barbour about his collage work, what kind of materials he likes to use, growing up in Naples, some of the places he has spent time in during his travels, living and working with a mountain man in North Carolina, why he moved back to Upstate New York, his own radio show right here on WAYO, a project he is currently working on, and much more! No guest! Just the Graphic Ear crew and friends playing alt Christmas/Holiday songs! In this edition of Graphic Ear on WAYO 104.3 FM we talk to St. Monci about the origins of his name, his roots in graffiti and why it drew him into the art world, his geometric abstract paintings, why he prefers to paint on matboard instead of canvas, his color palette, his first experience with A Tribe Called Quest, his process, making the transition to being a full time artist, his process when putting a show together, and so much more! In this edition of Graphic Ear on WAYO 104.3 FM we talk to Danielle Schnauber about attending the Rochester Institute of Technology, her senior show, working at an animal shelter and going back to school to be a vet tech, her own pets, her artwork and what influences it, where she makes art and her paints of choice, fancy dinosaurs, her painting process, and much more!